A structure consisting of a series of bars or steps between two upright lengths of wood, metal, or rope, used for climbing up or down something. If you have seen the picture with this post, you have probably correctly guessed that the definition is describing a ladder. We have real ladders and invisible ladders in our lives. 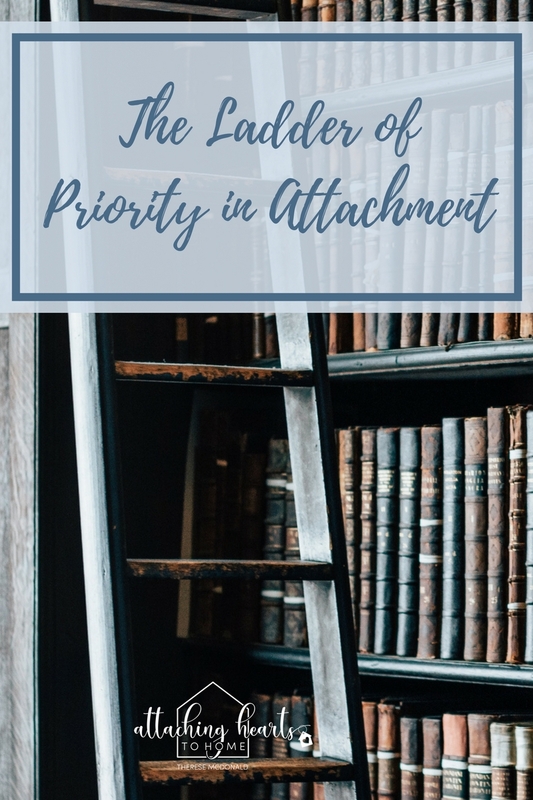 Today I'm talking about the unseen Ladder of Priority and the role it plays with Attachment in our family and homes. We are magnets. People are meant to attract powerfully. All of us. It is in our nature, design, and humanity. A mighty emotional bond is in our architecture. Some people mask it, bury it, run from it, attempt to destroy it, ignore it, and deny it. Usually that happens out of pain, neglect, dysfunction and disorder. However, we are created to attach. If we don’t attach to people, we’ll attach to things and behaviours. A very, very, powerful bond is attachment! Attachment forms in us a sense of self and of stability. We are oriented to being loved and to return love. It begins early and it is what allows us to navigate through the windy storms of emotions over a lifetime. Attachment has a right order. It is meant to capture our heart with particular priority. This means that everyone and everything we care about can be set on a type of ladder. This ladder has our most important affections on the top rungs, and our lesser likings on the bottom rungs. If we mess these up, our life is disharmonious and we act in ways that bring us into conflict with our relationships. We give an appropriate chunk of our heart and time, according to the ranking of our attachments. Those love bonds high on the ladder get much more of our attention than those further down the ladder. Our top relationships should be of far greater importance to us than our lesser attachments. When our priorities go out of order the Ladder of Attachment is no longer functioning properly. For example, if sports and leisure hold greater importance than visiting Grandma on her birthday, or if children take precedence over my spouse, we will experience disordered attachment and find discontent and trouble in our lives. Imagine what happens when priority attachments get bumped down the ladder and things such as screen time, or peers, or work, take number one, or two, or three spots? Eeega! It really does cause trouble between spouses, children, and certainly disturbs the peace and welfare of our lives. Remember, our primary attachment is given our proximity (presence), our loyalty, our engagement, and our cooperation. When it is in the right order, we hold dear the opinions of our loved one, and look to take our cues from them. Love connects. Love creates peaceful and harmonious teamwork. The good news is that even when we mess up and harm the people we love most, we can set things right again. The important thing is to identity when neglect our emotional bonds and do something about it. Nothing need stay troubled. There is always a way to heal by the grace of God and embracing strategies that renew relationships and put them in right order. Halleluiah! Therese speaks next week on the Ladder Of Attachment, click here to join the class.